Anyone who has ever been to a shopping mall knows that shopping for apparel and accessories is a social event. With the rise of smartphone penetration and social platforms which make sharing the shopping experience a global event, many millennials are using the technology to include others in their shopping experience, regardless of their location, and asking their friends to participate in the decision journey. Millennial women are shopping and their friends and family on social media are invited to come along for the ride. As part of our POPSUGAR Future of Retail Experiences study, we asked women to tell us how they are incorporating social media into their shopping experience. The oft-repeated behavior of asking, "Does this look good on me?" has evolved to a selfie taken in the aisle or dressing room of their favorite store with a group text, Snapchat, Instagram, or other social media post shared to get instant feedback. Over seven in 10 millennial women report that they've taken a photo with their mobile device and shared the photo with friends to get immediate feedback on what products they should purchase. But this behavior is not just limited to millennial women, as millennials are only 16% more likely to have taken part in this behavior than women between the ages of 18 to 49 overall. We've truly entered the era of showcase shopping. Beyond inviting others into the shopping decision journey, millennial women are also using social media to tout their purchases. 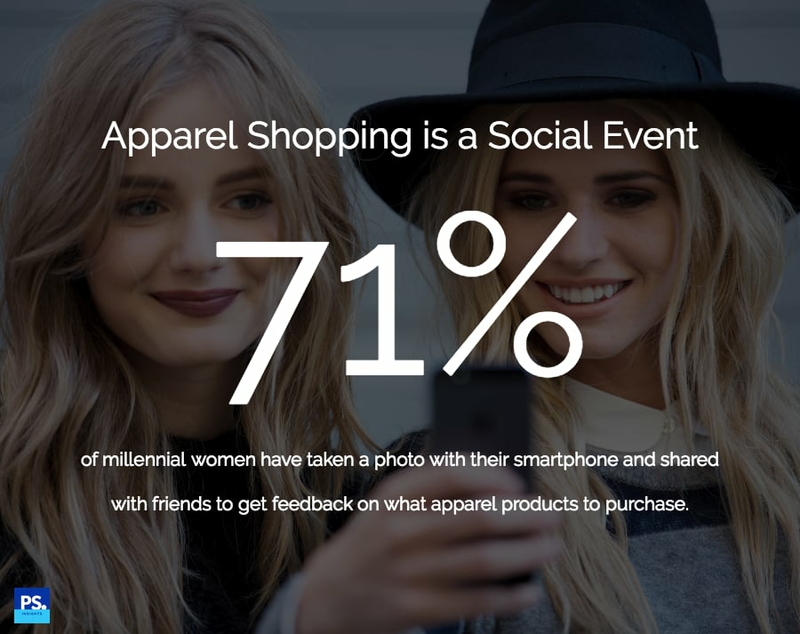 Over 60% of millennial women have used their mobile device to showcase their recent purchases by posting a photo of the apparel item they recently purchased. Millennial women are 24% more likely than women between the ages of 18 to 49 to engage in this behavior. Additionally, when women partake in these activities, often brands are invited to come along for the ride. Over 37% of millennial women have added a popular hashtag (such as #OOTD or #StreetStyle) to their post so that others can see what they've purchased and what they're wearing (28% more likely than women 18-49), and 52% of millennial women have included the name of the brand or the store where they purchased the item in the post. Beyond passive inclusion in social media posts, brands also have an opportunity to actively encourage their inclusion, by communicating their desire to have consumers share the brand, store, or location name, to check-in at store locations on social media, and to potentially highlight or include actual shoppers in their marketing. By being a truly open brand, marketers can yield positive benefits that extend far beyond an individual social media post.